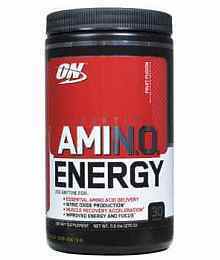 Bsn Amino X Unleash Your Performance Potential! Bsn Amino X is a stimulant free, BCAA formula designed to support endurance during your workout and aid in muscle recovery post training, so you can push your performance to the next level. Featuring a 10 gram blend of BCAAs and the essential amino acids, L-Alanine, Taurine and L-Citrulline, AMINO X will help your body recover from today’s workout and prepare for tomorrow’s. Offered in five refreshing flavors, AMINO X® provides you with versatile, nutritional support for any type of workout regimen. Amino acids are the building blocks of protein, and therefore, the building blocks of lean muscle. Branched Chain Amino Acids (BCAAs) refer to three specific amino acids – Leucine, Isoleucine and Valine – that the body must obtain from either food or BCAA supplementation. BCAAs can be used by muscle cells as an energy source, which may help offset muscle breakdown during endurance exercise and help support recovery and repair after weight training. As a result, BCAAs are a popular and relevant supplement among those who exercise regularly. Stack AMINO X with NITRIX 2.0, N.O.-XPLODE® & CELLMASS 2.0 for maximum physique and performance impact. * DIRECTIONS: As a dietary supplement, mix 1 scoop with 6-8 oz. of cold water or any beverage of your choice before, during, or after your workout. NOTE: To prevent settling, stir and drink immediately. To ensure maximum results: wait 20-30 minutes after taking AMINO X before eating a meal or drinking a shake. NOTE: To maximize the effects of AMINO X consume 120 oz. of water per day and a diet that is rich in protein and carbohydrates. Your body chemistry and weight will determine how long it takes to experience the effects of AMINO X.
Bsn Amino X begins to induce its maximum effects in weeks 3-12. After 12 weeks of use, discontinue for at least 4 weeks.